1. Why should I subscribe to VetPrep? VetPrep is a study resource with numerous features not available elsewhere to assist you in passing the NAVLE®. With its interactive, on-line format, VetPrep customizes your study sessions by creating detailed reports on your progress in all subject areas. This will allow you to allocate your study time to the areas that will help you most on your exam. The database also remembers the questions that you answer incorrectly and asks you those questions again until you get them right. Randomization of the answer choices prevents you from memorizing the location of the correct answer and helps you to actually learn the subject matter. VetPrep has the most extensive question database of its type with well over 3,000 questions and detailed answer explanations which serve as key learning material. VetPrep has an extensive veterinary and technical staff that keeps material relevant and up to date in all specialty areas. The practice questions are formatted similarly to that of the actual exam, allowing you to become more familiar and comfortable with the types of questions on the exam and the process of navigating through this type of test. The database covers topics most relevant and commonly covered on an entry level exam, and excludes most of the minutia that would be less efficient for you to study. In short, VetPrep is the interactive, straightforward, and to the point way to prepare for a veterinary board exam. Hundreds of VetPrep PowerPages provide focused review pages on important topics for your preparation. Also added are PowerLinks which take you to some of the best websites for information about specific topics for review. You can link to these pages from questions about those topics by clicking the link on the explanation page. You can also access the list of these pages from your account homepage. Premium users also gain access to hundreds of PowerLectures. These brief lectures provide review on important NAVLE® topics. They are given by experts in their respective fields and are intended for pertinent and condensed review. 2. What is the VetPrep Guarantee? VetPrep is confident that anyone who completes the VetPrep course will pass the NAVLE® on their first attempt. This is largely due to the question recycling aspect of VetPrep which essentially forces students to learn all of the material in order to make it through the entire course. Therefore, VetPrep will pay for your VetPrep re-subscription if you do not pass the NAVLE®. In order to qualify for a free re-subscription, you must have completed the full VetPrep course by finishing all (or at least 80% of all) practice questions and timed exam questions before the date of your NAVLE®. If you did not pass the NAVLE®, contact VetPrep support for instructions on how to submit the materials necessary to process your re-subscription. 3. Who writes VetPrep questions? Over 40 clinician veterinarians contribute and edit content. There are specialists in every major area that respond to student questions in addition to our outstanding customer and technical support staff. These veterinarians represent a mix of renowned experts and specialists as well as veterinarians with recent NAVLE® experience. This means that if you read a question and feel that you may have learned something differently, an e-mail to our support desk will be forwarded to an expert in that medical area so that you can receive an up to date response that you can trust. For a list of our contributors go to our authors page. 1. Can I answer the questions in VetPrep more than once? Through the course, you will take most questions at least twice, once in a practice mode and once in a practice exam. There are some questions that will appear only in one module but have the content and concept reinforced in the other section. This change was made based on student feedback that short, to the point questions are the most efficient way to learn key points. The question recycling aspect of VetPrep is one of its unique and special features. This feature forces the user to learn all of the material in order to successfully complete both sections of the program. VetPrep feels that anyone who has learned all of the material in the course should be in spectacular shape going into their exam. Additionally, for Premium subscribers, Pile of Done™ allows you to retake every question you've answered correctly. The flashcard-like format infinitely serves up questions randomly and your answers to these questions won't affect your statistics in any way. It's a nice way to brush on questions you did answer correctly in the past - especially those you maybe haven't seen in some time. Just note that this feature is only unlocked once you've completed 80% of the questions in the program. So it's a little something to look forward to as you make your way through VetPrep. 2. How many practice exams are there? The practice exam question database contains over 2,000 questions. Exams can be taken at varying lengths - anywhere between 5 and 60 questions per exam. So depending on the number of questions you take per exam, there will be a minimum of between 34 and 400 exams. However, you should note that if you miss questions in these exams, they will be recycled with answer choices re-ordered and asked again in a subsequent exam so you actually will have more than that number of exams depending on how well you do. 3. Are VetPrep questions taken from actual NAVLE® material? No. VetPrep questions are original and copyrighted and are not taken from previous NAVLE® material. Printing, distributing, or any other use of the questions, answers, explanations, photographs, or other material at this site is strictly prohibited without express written consent from VetPrep Corp.
Any person or company claiming to use NAVLE® material without their express consent is in violation of their code of conduct and use of such materials is illegal and could result in license forfeiture. VetPrep is a successful review program because the questions in the course cover a wide array of topics that an entry level veterinarian would be expected to know. By providing detailed explanations with many questions, even if the question on the topic is not the same on your NAVLE®, the material you have learned will help you reason your way to the best answer. 4. What do I do if I find a typographical error or believe a question, answer, or explanation contains an error? If you believe there is an error in a question, please copy and paste the question to VetPrep Support and indicate what you believe to be incorrect. If you have a reference for your viewpoint, feel free to include it. The VetPrep team meets weekly to review any questions about the course material and to make modifications and additions as needed. When needed, VetPrep may also contact an appropriate specialist to obtain the most definitive answer to your question which can take some additional time. 5. What is a VetPrep PowerLecture? A VetPrep PowerLecture is a focused and brief lecture on an important NAVLE® review topic. The goal of the PowerLecture is to keep information pertinent and condensed. There are over 150 concise PowerLectures which range in length from around 1-10 minutes each. 6. How do I access the VetPrep PowerLectures? VetPrep PowerLectures are available to users who have upgraded to a "Premium" account. VetPrep PowerLectures are often associated with specific questions, and linked to from those questions. Additionally, the Premium user may scroll through all available lectures by clicking on the VetPrep PowerLectures link on their home page. 7. What is the format of VetPrep PowerLectures? VetPrep PowerLectures are broadcast via our VetPrep Webcasting Interface which provides streaming audio and lecture slides from VetPrep experts. 8. How many times can I view a PowerLecture? VetPrep Premium subscribers will have unlimited access to PowerLectures. 9. Can I still sign up for VetPrep PowerLectures even after I signed up for VetPrep Standard? Users are welcomed to upgrade their subscription at any time to gain access to VetPrep PowerLectures. 10. What if I only want to sign up to VetPrep PowerLectures without signing up for the VetPrep Question Database? Users must be registered with a VetPrep subscription in order to have access to VetPrep PowerLectures. 11. Who are the lecturers for VetPrep PowerLectures? The VetPrep team has compiled experts from around the country to provide review lectures in the areas of their expertise specifically geared for NAVLE® Board Examination preparation. 12. What is VetPrep Mobile? VetPrep is fully accessible from all devices - including smartphones and tablets - however we do also offer iOS and Android apps that make the experience that much slicker. The apps are free and available, respectively, from the iTunes App Store and Google Play Store. 13. Do I have to pay for VetPrep Mobile? VetPrep Mobile is free to all VetPrep subscribers. 1. How long is my VetPrep subscription valid? 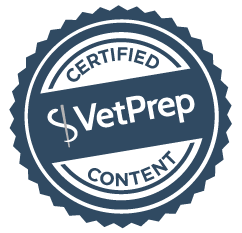 Depending on the plan you select, a VetPrep subscription is typically valid for 45, 90, or 180 days from the date of payment. VetPrep allows 30-day subscription extensions. The cost for a 30-day extension is $50. Smaller increments are not available. When your VetPrep subscription expires you will automatically be prompted to sign up for an extension if desired. 4. Can I share my VetPrep account? VetPrep prohibits sharing of your account and monitors all account activity. VetPrep reserves the right to cancel a subscription if unauthorized use suspected. Additionally, sharing of accounts will alter your personalized performance record and reduce the number of questions you have available to take. 5. How can I become a student representative? Every year, VetPrep seeks a member of the junior class of each veterinary school to serve as a student representative for their class during their senior year. Job responsibilities are to distribute a small amount of material to all classmates to inform them about what VetPrep has to offer. This is minimally time consuming and is expected to take 5-10 hours of work over an entire year. We encourage any interested students to e-mail VetPrep support and further details will be provided. 1. I am unable to register for an account with VetPrep. What can I do? If you are confident that you have input all of the information correctly but still get the same error message repeatedly, contact VetPrep support so that we can determine the cause of your registration failure and help you to sign up. Another reason why this may happen is because of an intermittent Internet connection. This means that you may lose your Internet connection, or it is reset for a brief period of time (could be under a second), and hence the server sees you are already logged in. Please wait 15 minutes before trying to log in again, and you may continue studying with VetPrep! If you suspect that someone may have obtained your password and is using your account, contact VetPrep support immediately. Click Account Info in the upper right corner of your VetPrep homepage. 6. What are the system requirements to use VetPrep?